Megan Gustafson, a 6-foot-3-inch junior forward, has rapidly become one of the most dominant post players in UI history—and in the nation. This year, the Port Wing, Wisconsin, native has shouldered the load for the Hawkeyes, leading them to their ninth season of 20 wins or more in 11 years, despite injuries to starters Tania Davis and Makenzie Meyer. 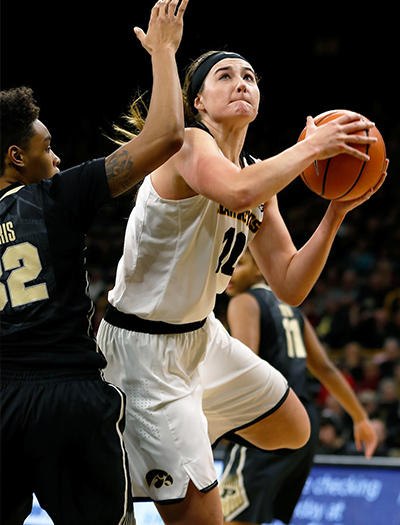 Owning the Iowa women’s single-season records in points and rebounds, Gustafson scored a career-high 37 points against Purdue in January and broke the UI men’s and women’s record in February for career double-doubles. The 2016-17 first team All-Big Ten member also set a single-season conference record for Big Ten Player of the Week honors. How did you first get involved in basketball? GUSTAFSON: Basketball was a big part of my family growing up. My parents played college basketball, and my older sister played at Upper Iowa University, so I was introduced at a young age. I loved it from the beginning. How quickly did you excel? GUSTAFSON: I grew up in a really small town, so I would often have to help with the grades above me. In second grade, I’d play with the fifth- and sixth-graders. And in fourth grade, I’d help out the middle school teams. That helped develop my game really early. In eighth grade, there weren’t enough girls out for the team, so I joined the boys’ team. That toughened me up. Why did you choose the UI? GUSTAFSON: I knew the women’s [basketball] program was amazing. The coaches have been here a long time, so that was important to know they were going to be here. They’re fantastic people—they care about me more as a person than as a basketball player. The team is so fun to be around. We care about each other, and we like to goof off. The UI also has a fantastic business program—that sealed the deal for me. Do you have any interesting recruiting stories? GUSTAFSON: It’s a big trek to come to Port Wing. [UI assistant coach] Jan Jensen flew into Ashland, Wisconsin, which is about 45 minutes from my town. She was the only person in the airport, and there was an envelope waiting for her with instructions to get a key for her rental car. She drove 45 minutes through a blizzard to get to my game. GUSTAFSON: My teammate Hannah Stewart braids my hair before every game. She loves doing it. My hair is really long and thick, and I asked her because I knew she could do hair. It’s usually after I get treatments from the athletic trainer and before I put my headband on. It’s kind of a superstition. How long have you been wearing a headband? GUSTAFSON: I’ve worn a headband ever since I was little; that’s how people recognize me. It’s almost an extension of myself on the basketball court. GUSTAFSON: Sandra Bullock or Jennifer Lawrence. I love seeing movies where there’s a strong female lead and seeing how passionate they are.